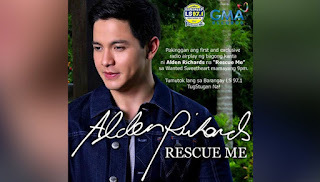 Home / Entertainment / Listen to Alden Richards' newest single "Rescue Me"
Listen to Alden Richards' newest single "Rescue Me"
The Pambansang Bae, Alden Richards gave his fans the "tamang panahon" to listed to his brand new single entitled, "Rescue Me" from his forthcoming album Say It Again. Tisoy's new song was previewed at Barangay LS 97.1's popular segment "Wanted Sweetheart". Alden's new single was composed by Agat Obar-Morallos, the same person who's responsible for his other hit single, "Wish I May". What can you say about Alden Richards' brand new single? Here's the lyrics of the song "Rescue Me"